Burning corn will do that to you. If you are that stupid, then have at it. Global food prices have leapt by 10% in the month of July, raising fears of soaring prices for the planet’s poorest, the World Bank has warned. The price of key grains such as corn, wheat and soybean saw the most dramatic increases, described by the World Bank president as “historic”. The bank warned countries importing grains will be particularly vulnerable. The USA is sticking to the nonsense of converting billion bushels of corn to gasoline stocks. Stupid live high. Inflation anyone? So exactly why ate the idiots at the Fed looking at QE3. It’s not going to reelect our stooge Preezy. The economy is still the number one issue on voters’ minds this election season, and a plurality continues to give President Obama poor marks in this area. A new Rasmussen Reports national telephone survey finds that 35% of Likely Voters believe the president is doing a good or excellent job handling economic issues. Forty-four percent (44%) give Obama a poor rating in this area. So you want morons? Plenty here. Freeloaders as Nancy Pelosi says? If you think your net worth dropping 40% was something, wait until the second term. Jigs up boys … We don’t need you anymore. The lies are too much to take anymore. Yep plenety of time for Obama and his car company to contie production of swich to whatever rot gut car Obama wanted. 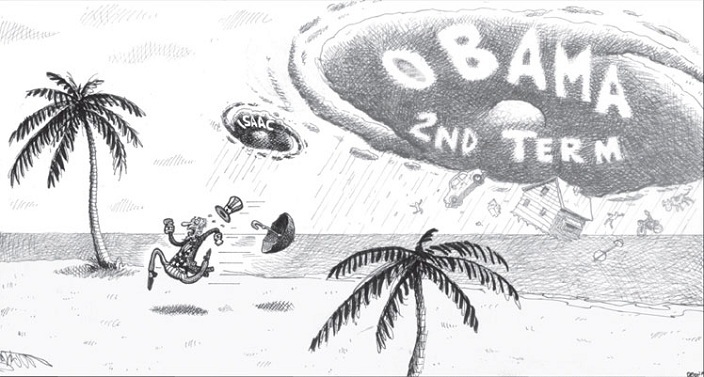 Well this didn’t last, following Romney, Obama decides to visit La. Got under his skin ehhh? Leading from behind, once again. The reaction to Clint Eastwood’s “invisible Obama” routine at the Republican National Convention last night came down hard, setting Twitter on fire and giving political pundits plenty to talk about. It was a hoot “I can’t do that”!!! Said the empty chair … Hours after Republican presidential nominee Mitt Romney visited Louisiana in the aftermath of Hurricane Isaac on Friday, White House press secretary Jay Carney announced President Barack Obama would call an audible in his schedule and visit Louisiana on Monday to assess the storm’s damage. 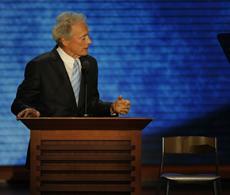 Obama’s leading-from-behind reaction to Romney’s visit reaffirmed Clint Eastwood’s empty chair analogy. “This seat’s taken,” President Obama’s re-election team posted on Twitter, along with a photo of Obama sitting in his chair. Outed Obama did it? You are currently browsing the Tarpon's Swamp blog archives for August, 2012.